Emilia speaks softly with a lovely palette of alabaster hydrangea and fragrant lily, pastel lavender stock and peach roses arranged in a low, gathered, glass vase. Stunning simplicty perfect for any occasion. This is a representation of the arrangement, it will never look exactly like a picture. Although the actual bouquet may not precisely match the photo, its temperament will. Occasionally, substitutions of flowers or containers happen due to weather, seasonality and market conditions which may affect availability. If this is the case with the gift you've selected, we will ensure that the style, theme and color scheme is preserved and will only substitute items of equal or higher value. Santa Maria CA leading local florist. 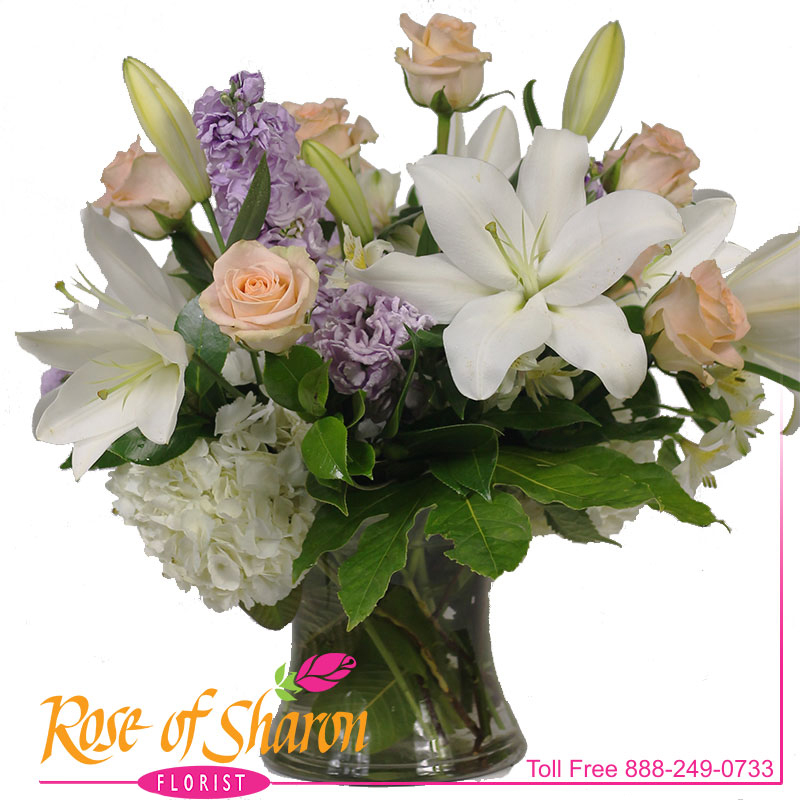 Daily delivery of fresh flowers, houseplants, blooming garden plants, Gift Baskets, Birthday Flowers, Anniversary Flowers, Sympathy Flowers, Funeral Flowers in Santa Maria, Orcutt, Arroyo Grande, Grover Beach, Nipomo, and surrounding areas.